This is a beautiful costume and very well made. The dress is fully lined and the sequins and gold cording are sewn on, not printed. A size medium (8-10) fit our average-sized 8 year old. The dress was a little roomy and she wore a t-shirt underneath for a school performance. Highly recommend this costume! We got size 8/10 for a 9 year old girl. She loved it! It fit well, and was really pretty. 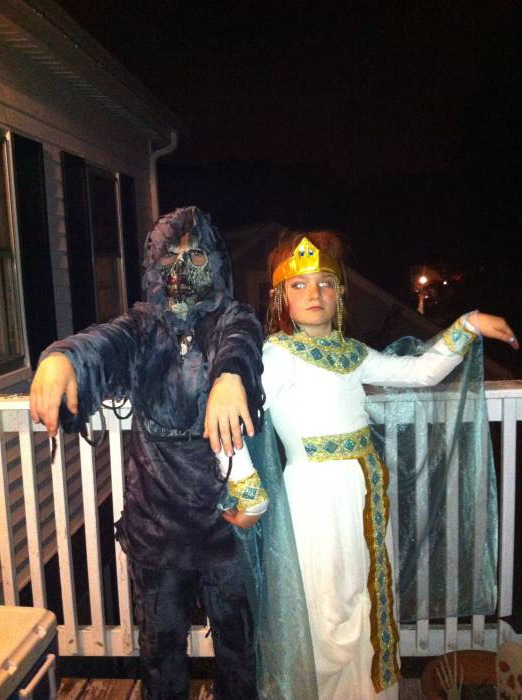 (We bought some fancy jeweled flip flops to go with the costume.) This was for a school project this Spring, the kids dressed up like famous people in history. Her costume was a big hit. She is wearing it for Halloween also because she loves it so much. The costume is good quality. Everything in the picture is what showed up in the package. We are pleased with this purchase. It was very helpful to me. Its a great fabric quality and my daughter looks amazing the head piece I used around her waste cause it was a bit to small. 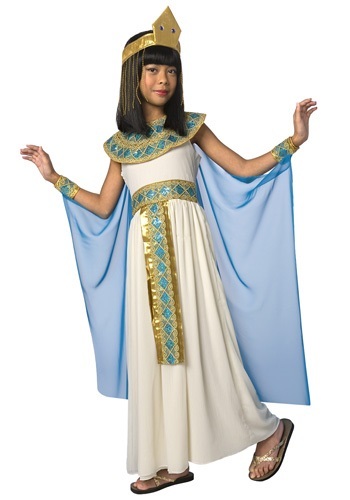 Walk Like An Egyptian In This Gorgeous Costume! We love it! My daughter looks like a little Egyptian Queen. Ordering online was convenient and easy. It arrived sooner then the estimated shipping date and was packaged well. My daughter is 5 yrs. old so we ordered the small (4-6). The dress is a little long and a little too big around (room to grow) so we just clipped the back together to make it fit, and the accessories fit well. This is a rich and elegant costume for the price point and comes with high quality accessories. The one piece v-neck dress is made of a soft ivory double layered fabric with an attached (sewn) ornate gold lame & lace fabric belt with aqua blue sequins. It fastens up the back with Velcro. The collar and wrist cuffs are made of the same ornate material and also fasten with Velcro. It comes with an attractive gold snake headpiece with jeweled eyes and gold beaded fringe. It attaches with Velcro in the back as well. The accessories are very detailed and really sparkle. The cape (which looks different than the photo) is a sheer bright turquoise that attaches to the shoulders and wrist cuffs by Velcro. The photos don't do this costume justice you need to see it in person. My daughter loves it! I ordered the same one for me and even though it isn't Halloween yet we can't help but dress up in them and dance to The Bangles "Walk Like An Egyptian".